Give 'em an act with lots of flash in it! Give ’em the old razzle dazzle, and they’ll make you a star! 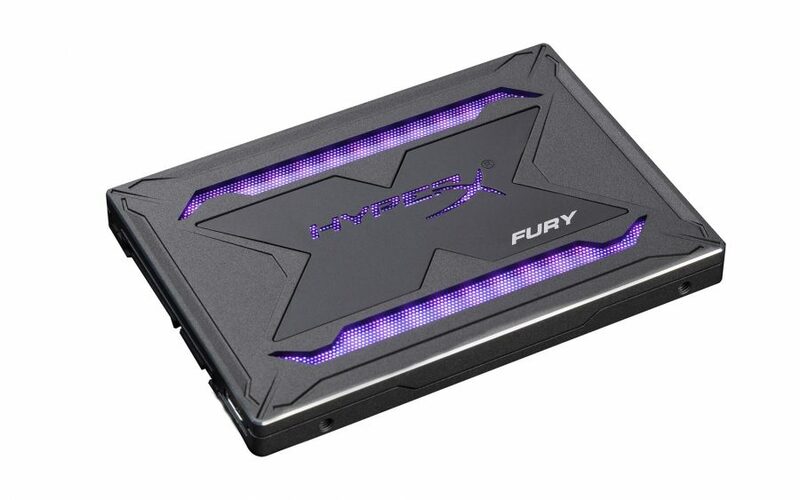 Or so HyperX hopes with its latest Fury SSD. The HyperX Fury RGB SSD comes equipped with, you guessed it, RGB lighting across its 2.5-inch chassis. Finally offering up a new level of storage drive customisation you never thought possible… or necessary. The price of your average SATA SSD has been declining as of late. Hurrah! 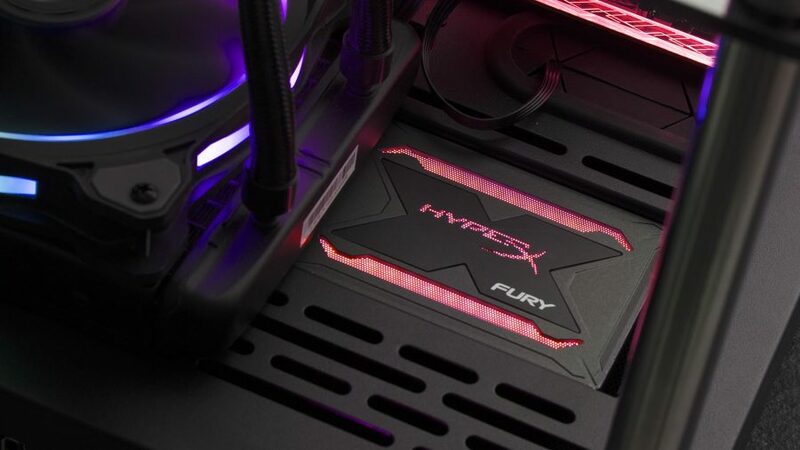 But if you fancy spending a little more on your SSD than is required in the name of A E S T H E T I C, then the HyperX Fury RGB might be just the ticket. The perfect SSD for gamers that need a little light in their life. In the test bench we’ve got the 480GB model, enough space for an OS and a modicum of game installs by today’s triple-A standards. Both 240GB and 960GB models are available if you prefer a little more elbow room on your main SSD squeeze, however, and all three models are made up with parent company Kingston’s 3D TLC NAND and paired with one of Marvell’s 88SS1074 controllers. But this isn’t about inner beauty. No, the HyperX Fury RGB SATA drive is an entirely vain and ostentatious creature. Controlled via a single USB cable straight to the drive, the HyperX Fury RGB features sunken lighting bars on either side of its front facade and an illuminated logo. These are both daisy chain-able and play nice with most major motherboard brands’ RGB lighting suites to sync up with the rest of your rig. Though the RGB should increase performance tenfold, the Fury RGB only manages to keep apace with modern SATA drives from the likes of Samsung and Crucial, and rarely ever surpasses them. Most SATA drives these days are held back by the interface itself rather than any theoretical NAND limitations in the die, but that doesn’t stop Samsung’s 860 Evo from coming out on top in real-world and synthetic benchmarks. Maybe that third-party controller isn’t as optimised as the rival’s chip can be. Nevertheless, the results show the Fury RGB falling noticeably behind the Samsung in a 30GB file transfer – a mix of compressible and incompressible data. The same can be said for 4k AS SSD benchmarks, during which the Fury RGB noticeably lags both the Samsung drive and Crucial’s MX500. For the most part, however, the HyperX drive lands right in the mix alongside the affordable Crucial drive. Only in AS SSD does the HyperX successfully surpass the Samsung 860 Evo, managing to maintain equilibrium across both read and write performance. Whereas the Samsung and Crucial drives both slow in the latter. But, while that’s all well and good in the grand scheme of things, both the Samsung and Crucial drives are cheaper at $83 (£75) and $68 (£63), respectively. There’s a premium associated with RGB lighting that the HyperX drive just can’t kick, and that means you are paying not an insignificant sum more for lesser performance. But I don’t hold the Fury RGB to a fault for its price. Lighting is a premium feature, and if you don’t want your drive to light up like the 4th of July there’s a plethora of drives on the market – many others from HyperX even – that will satiate your restrained requirements. Though If you do value aesthetic above all else – even friends, family, and fiscal responsibility – the HyperX is the de facto SSD of choice. And with performance still in the upper-bands of the SATA standard, you won’t have to sacrifice a great deal for the razzle dazzle. Some SATA drives are faster, and some cheaper, but none are quite as ostentatious as the HyperX Fury RGB.